ONE: Chop and melt 12 oz. of the Clear Melt and Pour Base, and 1 oz. of the Goat Milk Melt and Pour Base in the microwave using 20 second bursts. A combination of bases is used to give a rich brown color, while still being slightly opaque. 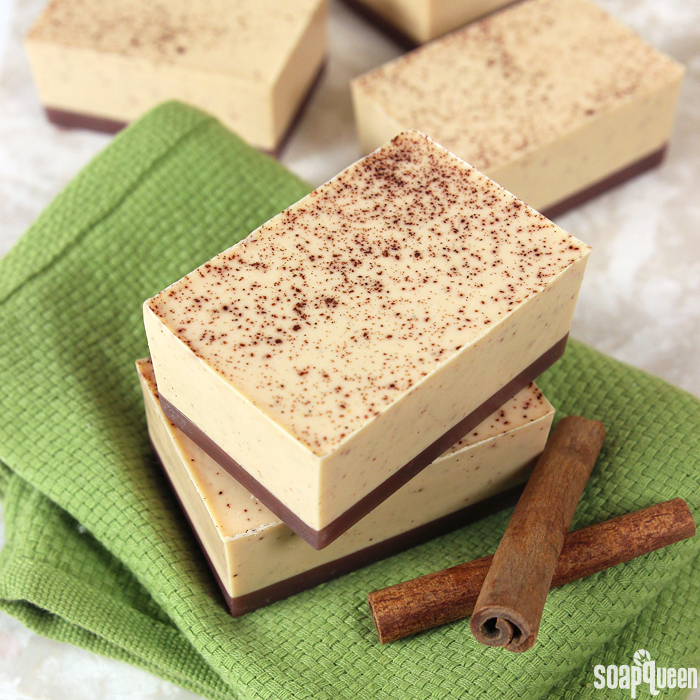 Once melted, add shavings of the Shimmer Cappuccino Color Block and stir until they have melted and the soap is a rich brown color. If necessary, place the soap back into the microwave using 10 second bursts to reheat. 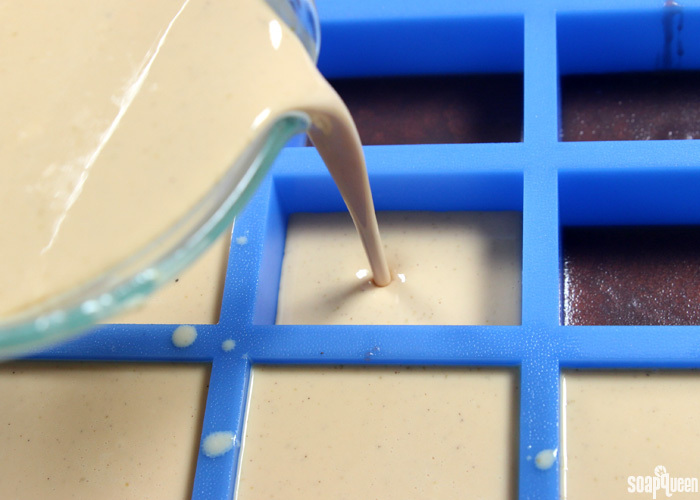 TWO: Pour the brown soap evenly into all 12 cavities of the mold. Each cavity will receive about 1 oz. of soap. If it helps, weigh the first pour and eyeball the rest. After pouring, spray each cavity with rubbing alcohol to disperse any bubbles. Set aside to cool and harden. THREE: Chop and melt 40 oz. of Goat Milk Melt and Pour Base in the microwave using 30 second bursts. Once completely melted, add shavings of the Perfect Orange Color Block until you have reached a soft orange color. Keep in mind that because the base is white, the soap will never be bright orange. If you prefer a brighter orange color, you may consider using clear soap for this step. FOUR: Add 1 oz. of the Pumpkin Pie Candle and Soap Fragrance Oil and stir to combine. Then, 1 oz. 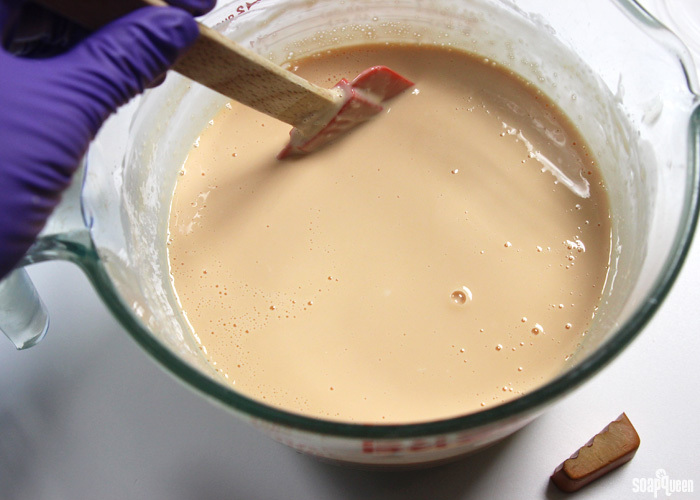 of the Vanilla Color Stabilizer into the soap and stir to thoroughly combine. The Vanilla Color Stabilizer is used to prevent the Pumpkin Pie Candle and Soap Fragrance Oil from discoloring the soap. Learn more about vanilla color discoloration in this blog post. FIVE: Add three heaping tablespoons of ground pumpkin seeds and stir to combine and get rid of any large chunks. 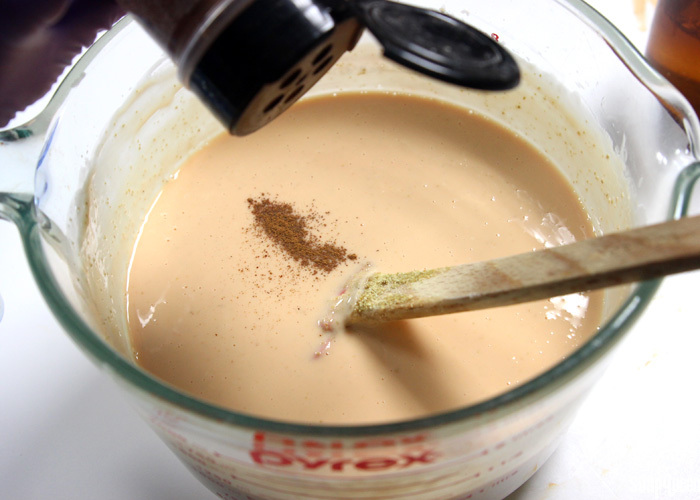 Then, add a few dashes of ground cinnamon. A little goes a long way; you want just enough so that you see a few speckles in the soap. If your skin is sensitive to cinnamon, feel free to leave this step out. SIX: Check the temperature of the orange soap. You want to make sure it is no hotter than 125 ° F. If it is too hot, the ground pumpkin seeds will not suspend and the soap may melt the dark brown layer below. Check to make sure the brown soap has cooled and developed a thick skin in order to support the orange soap. Spritz the brown layers with rubbing alcohol to help the orange soap stick, and gently pour the orange soap into each cavity. Spritz the soap with alcohol to disperse any bubbles. 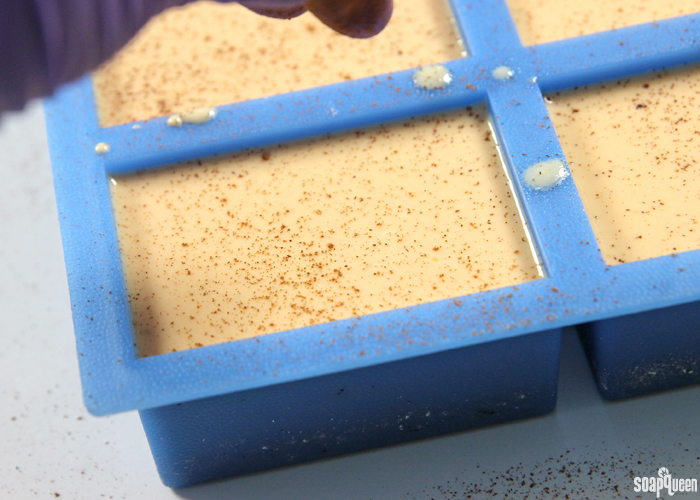 SEVEN: Immediately sprinkle the top of the soap with a fine dust of ground cinnamon. Allow to fully cool and harden, and enjoy! To avoid glycerin dew, wrap them immediately in plastic wrap, or another airtight packaging option. What is your favorite pumpkin spice fall treat? I love pumpkin spice breakfast dishes, like this Pumpkin Pecan Baked Oatmeal! 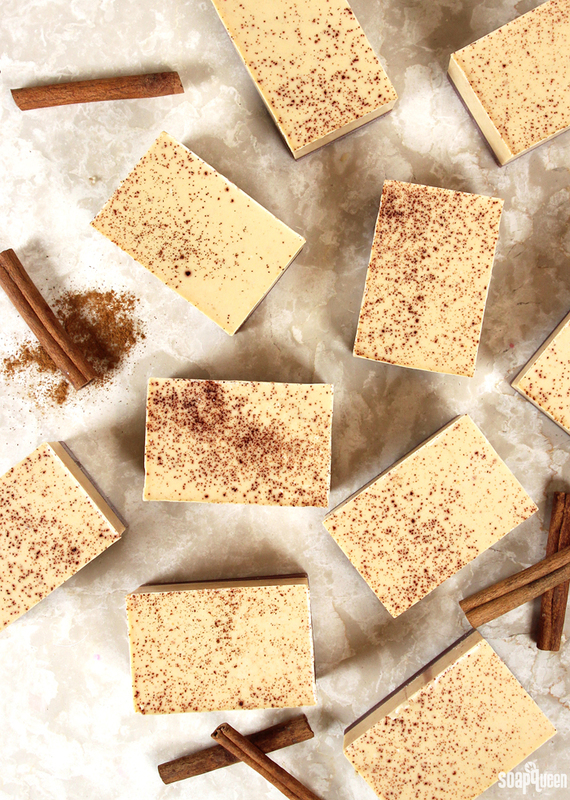 These Pumpkin Pie Melt and Pour Bars look and smell like real pumpkin pie. Ground pumpkin seeds and real cinnamon give gentle exfoliation. Chop and melt 12 oz. of the Clear Melt and Pour Base, and 1 oz. of the Goat Milk Melt and Pour Base in the microwave using 20 second bursts. A combination of bases is used to give a rich brown color, while still being slightly opaque. 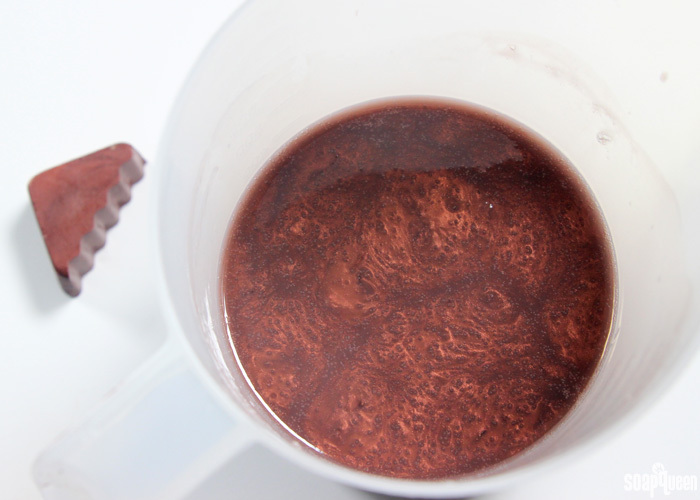 Once melted, add shavings of the Shimmer Cappuccino Color Block and stir until they have melted and the soap is a rich brown color. If necessary, place the soap back into the microwave using 10 second bursts to reheat. 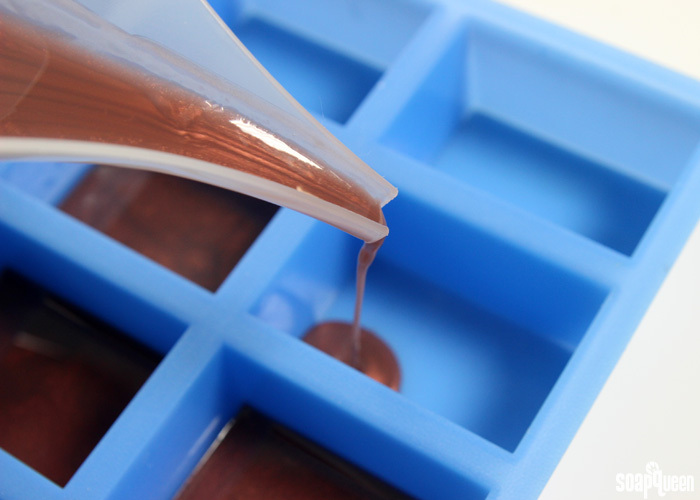 Pour the brown soap evenly into all 12 cavities of the mold. Each cavity will receive about 1 oz. of soap. If it helps, weigh the first pour and eyeball the rest. After pouring, spray each cavity with rubbing alcohol to disperse any bubbles. Set aside to cool and harden. Chop and melt 40 oz. of Goat Milk Melt and Pour Base in the microwave using 30 second bursts. Once completely melted, add shavings of the Perfect Orange Color Block until you have reached a soft orange color. Keep in mind that because the base is white, the soap will never be bright orange. If you prefer a brighter orange color, you may consider using clear soap for this step. Add 1 oz. of the Pumpkin Pie Candle and Soap Fragrance Oil and stir to combine. Then, 1 oz. of the Vanilla Color Stabilizer into the soap and stir to thoroughly combine. 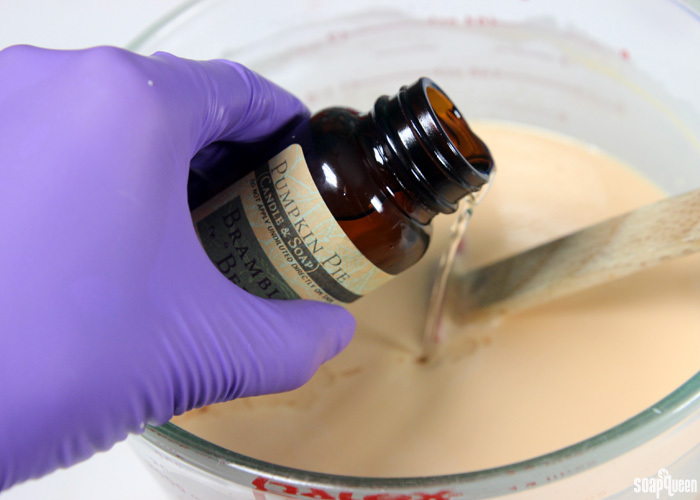 The Vanilla Color Stabilizer is used to prevent the Pumpkin Pie Candle and Soap Fragrance Oil from discoloring the soap. Learn more about vanilla color discoloration in this blog post. Add three heaping tablespoons of ground pumpkin seeds and stir to combine and get rid of any large chunks. 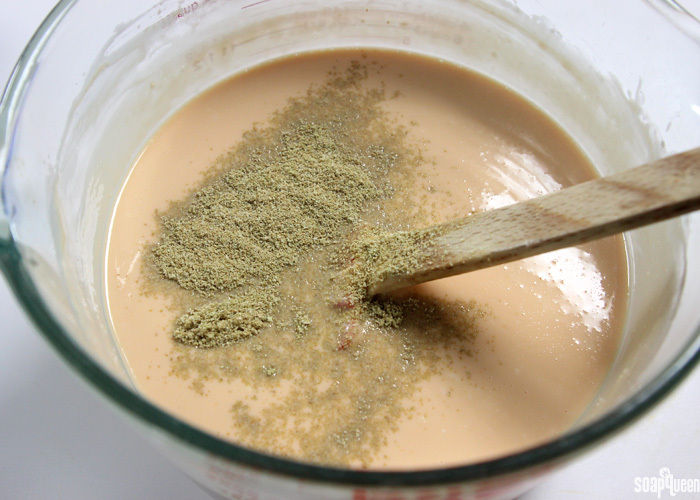 Then, add a few dashes of ground cinnamon. A little goes a long way; you want just enough so that you see a few speckles in the soap. If your skin is sensitive to cinnamon, feel free to leave this step out. Check the temperature of the orange soap. 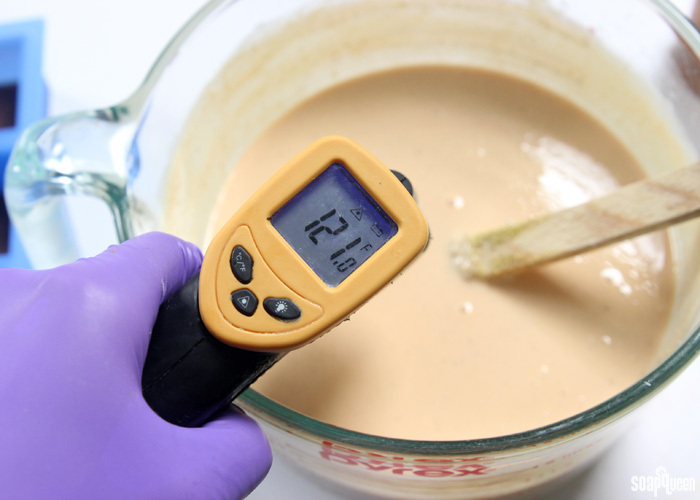 You want to make sure it is no hotter than 125 ° F. If it is too hot, the ground pumpkin seeds will not suspend and the soap may melt the dark brown layer below. Check to make sure the brown soap has cooled and developed a thick skin in order to support the orange soap. Spritz the brown layers with rubbing alcohol to help the orange soap stick, and gently pour the orange soap into each cavity. Spritz the soap with alcohol to disperse any bubbles. 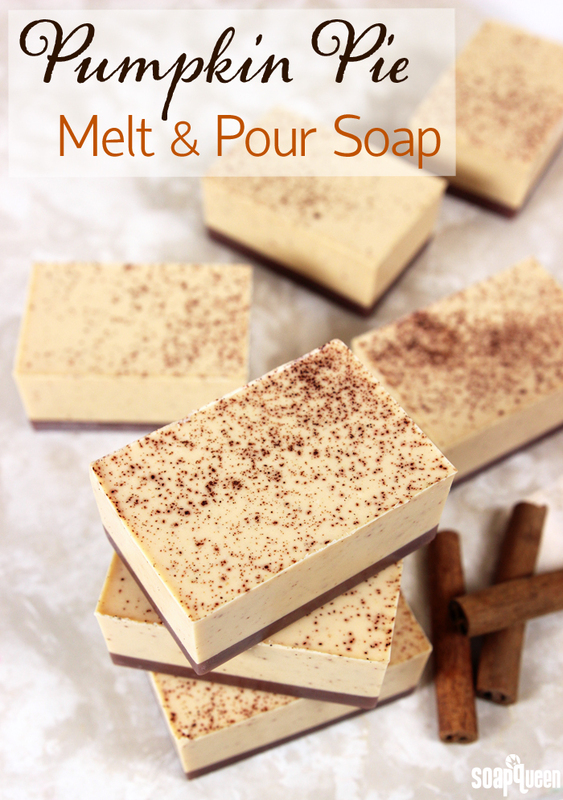 Immediately sprinkle the top of the soap with a fine dust of ground cinnamon. Allow to fully cool and harden, and enjoy! To avoid glycerin dew, wrap them immediately in plastic wrap, or another airtight packaging option. Just made this morning. First time making melt and pour. It turned out AWESOME! Cannot wait to use it! I made this recipe less orange for Christmas, I love them! I just started making soaps. Two questions. The top is shiney the from the alcohol, should I just dab with a paper towel before I wrap and also, where my thumb was when I pushed out the bar from the mould, the cinnamon came off just on those spots, Can I sprinkle some more on those spots? I sprinkled a little more cinnamon on top and it sold the issue. Hi, I just made this project, so fun!! Smells amazing. I do have a couple questions. 2. What is in the vanilla color stabilizer, and how would I list it on a label? How long were you melting the soap, and how much? What temperature did you add the color block, and was it shaved into small pieces? Let me know and I’ll help you troubleshoot! The 40 oz on 20 second bursts with mixing in between for about 2 mins. The color block was shaved into small pieces and added about 127 degrees. To explain it better it developed a film over the top (like when you boil milk) and then hardened and became stringy. Thanks! Why does my soap become leathery when I spritz alcohol on it? What am I doing wrong? Would the cocoa butter base work with this recipe in place of goats milk? 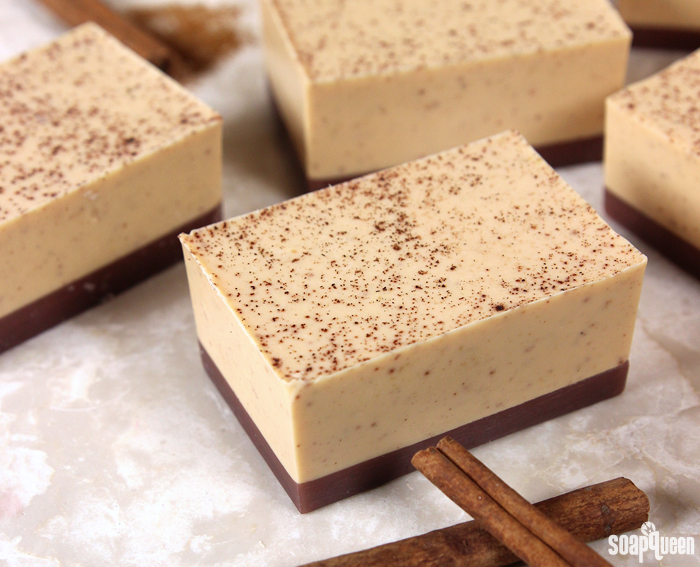 Hi before I make the pumpkin pie melt and pour soap just wanted to ask – the very last step when you have poured in the top layer it doesn’t say to spritz with rubbing alcohol but just to put cinnamon on top. Do you not need to do the final spritz of rubbing alcohol to prevent bubbles on top and then add the cinnamon??? This is my second batch of soap but the first one I made used our. The process was no problem and made some good soap (which I am almost out of). Anyhow, that took several weeks to cure. The question I have with this pumpkin pie soap is, how long should it cure? I plan on making it tomorrow and wanted to be sure since it is not lye based. Used lye, not our. Stupid autocorrect! What can be used in place of the orange color block-you are out of stock? Hi! If I have just a regular silicone loaf mold could I use that instead of the 12 cavity rectangle mold? And just put the bottom shimmery layer completely along the bottom of the loaf mold? Absolutely! A silicone loaf mold would work just fine for this recipe. In that case, you would pour all the brown soap in the bottom, let that harden and then pour all of the creamy orange soap on top. Hi I made this soap and the layers separated. I used alcohol in between and the first layer was cool enough when I added the second. Is there any way to fix these? This is going to be my second attempt at making soap! I only tried it on a whim last week with stuff from a craft store and thoroughly enjoyed it (but was disappointed when I saw the ‘not so organic’ ingredients). I hope my customers will like them (adding them as a little ‘thank you’ for purchasing.) I am afraid of the cold soap making method (eeek lye! ), and want to ease in slowly! Very excited to receive all of these ingredients to get started!!! Who knows, I may end up selling soap, too! I don’t have a microwave; would it be possible to make this using a double boiler? When you click the add everything to cart button, it only places 1lb of the Goat Milk Melt and Pour in there. I am guessing that was a mistake and that I’ll need a little bit more? Do you think shea soap would work as well as the goat milk? Thank you! I have one more question. I have the pumpkin pie cybilla fragrance. Can you tell me how this pumpkin pie fragrance differs from the cybilla one. Will the Cybilla one work? How many soap bars do the above ingredients yield? Make sure you label them as non-edible! I know I’d totally eat one! I so love pumpkin everything, soft pumpkin cookies are my favorite.